Kaiteri Lodge is just 50 metres from the golden sands of Kaiteriteri Beach. The lodge is a 20-minute drive from Abel Tasman National Park, and the property's staff can help you plan your activities during your stay. 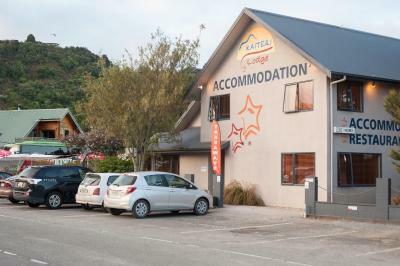 Located 2 minutes’ walk from Little Kaiteriteri Beach, Torlesse Motels features accommodation with a kitchenette and a balcony or patio. Guests enjoy access to BBQ facilities and a hot tub. Just a 10-minute walk from Kaiteriteri Beach, Kimi Ora Eco Resort offers rooms with a balcony and sea views. Guests enjoy free WiFi, free breakfast and a range of facilities including a spa and wellness centre. Just a 10-minute walk from Kaiteriteri Beach, Bay Vista offers self-contained accommodation with ocean, mountain and garden views. Guests can relax on the private patio, which has its own BBQ facilities. Just 10 metres from Kaiteriteri Beach, this room features free WiFi, a balcony offering sea views and lovely tropical gardens. Guests have access to scenic cruises and trips to Abel Tasman National Park. Surrounded by tranquil native bushland, Split Apple Lodge is 10 minutes' drive from both Kaiteriteri Beach and Abel Tasman Park. There is a spacious communal deck offering panoramic views of the Takaka Hills and Tasman Bay. Kaiteriteri Reserve Apartments is set in Kaiteriteri overlooking the golden sand beach. The accommodation is air-conditioned and features a flat-screen TV. The property is located 34 km from Nelson and 9 km from Motueka. Offering a barbecue and views of the sea, Ngaio Cottage is set in Kaiteriteri in the Tasman Region, 35 km from Nelson. Free private parking is available on site. All rooms have a TV. Some units feature a seating area where you can relax. Captains View is a detached holiday home situated in Kaiteriteri and featuring a garden with a barbecue. 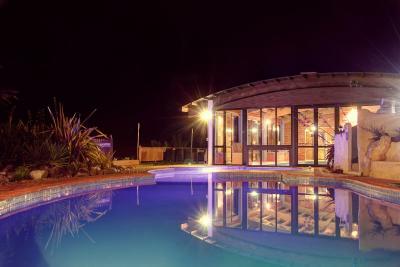 The property is 34 km from Nelson and boasts views of the sea. Free private parking is available on site.